Zimbabwe is currently facing a political and economic crisis which have resulted in series of protests met with security crackdowns. President Mnangagwa (L) and his biggest rival Nelson Chamisa (R) from the MDC Alliance. Churches in Zimbabwe on Thursday set up a meeting between the government and the opposition. It was meant to help find a lasting solution to the country’s political and economic challenges. 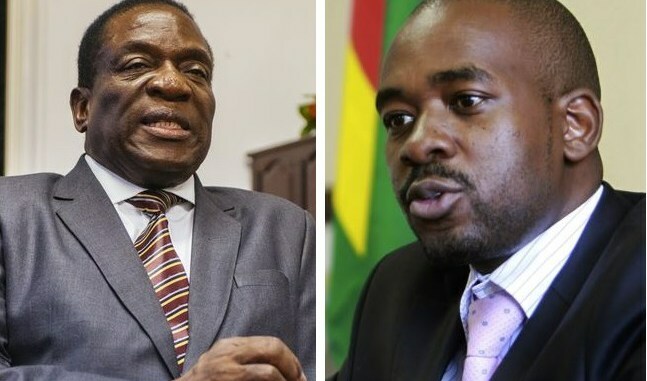 It came a day after the opposition leader Nelson Chamisa rejected an invitation from President Emmerson Mnangagwa to participate in a national summit. Wednesday’s dialogue was aimed at finding practical solutions to the country’s worsening economic challenges. The protests and agitations are over high fuel prices. The government increased petrol prices from $1.24 a litre to $3.31, with diesel up from $1.36 a litre to $3.1. The Zimbabwe government blamed the opposition MDC for fueling the protests. But the Zimbabwean security forces have been accused by rights groups of carrying out “systematic torture” in their crackdown on protesters. Mnangagwa’s national dialogue on Wednesday was however attended by some representatives from smaller political parties. Why did the church step in? According to the church leaders they had to be courageous and force talks between the political parties. They are hoping to find a solution to the challenges facing the country that had left it “angry and traumatized”. “Zimbabwe is clearly hurting, angry and traumatized nation,” Bishop Ambrose Moyo, who heads the Ecumenical Church Leaders Forum, said during a prayer meeting with the politicians. President Mnangagwa did not attend Thursday’s meeting although he confirmed he will attend earlier. He was represented by Defence Minister Oppah Muchinguri-Kashiri. Nelson Chamisa, other politicians, diplomats, business leaders and several ministers attended Thursday’s meeting. The last time the MDC held talks with the ruling ZANU-PF was in 2008. It resulted in the formation of a unity government that ushered a period of political and economic stability. According to Chamisa, Zimbabwe’s political and economic problems would not be fixed until the issue of Mnangagwa’s legitimacy was resolved. He backed the churches’ initiative, saying the clergy were independent mediators. Chamisa said any dialogue that did not involve Mnangagwa and himself would not succeed.